After a years-long battle between conservationists and a Connecticut developer, the parcel along the Exit 4 interchange in Randolph will be conserved. 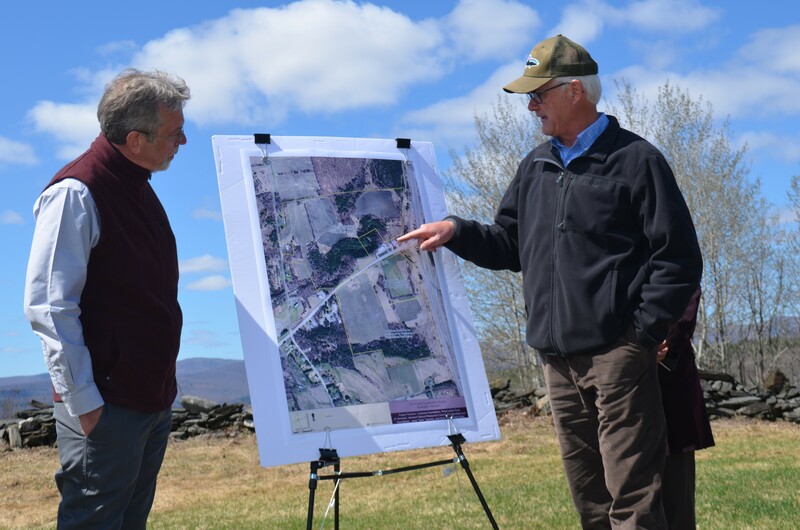 On Monday, environmental nonprofits and a local citizens group announced that they met their fundraising goal of $1 million — the cash needed to buy the final 22.5-acre tract along Interstate 89 from developer Jesse "Sam" Sammis. The Conservation Law Foundation, the Vermont Natural Resources Council, the Preservation Trust of Vermont and local activists Exit 4 Open Space spent the last two months furiously making phone calls and soliciting donors to meet the June 15 deadline that Sammis set. Paul Bruhn, executive director of the Preservation Trust of Vermont, dubbed it an "amazing and miraculous" effort. The transaction will be the last nail in the coffin of Sammis' nearly decade-long effort to build a multiuse development on the land. The 172-acre tract was to host a welcome center, a rest stop, a 180-room hotel and conference center, as well as 274 homes, a fitness center, and light industrial space. "The outstanding scenic views will be protected, prime agricultural soils will be used for agricultural purposes and this key step will help build a stronger downtown Randolph," wrote Bruhn in a press release. Exit 4 Open Space solicited more than 400 donations of between $10 and $1,000, Bruhn said. The other organizations, led by the Preservation Trust, managed to come up with larger checks from individuals and foundations. The closing for the land is expected in mid-July, Bruhn said. VNRC, CLF, the Preservation Trust and Exit 4 Open Space opposed the project during the permitting process. In early 2016, Sammis withdrew his Act 250 application and agreed to enter into a mediation process with the objectors. In April, Sammis announced that he would sell 149 of the 172 acres to the Castanea Foundation for $1.2 million. The land will eventually be preserved and sold to Ayers Brook Goat Dairy, which sells to Vermont Creamery. The final, most valuable portion along the interstate had to be purchased for $1 million by June 15 — or was to remain in the hands of Sammis to be developed as he pleased. "We got a very good deal and are very appreciative that Sam Sammis was willing to give all of us the opportunity to acquire the property," Bruhn said, noting that the property was assessed at about $3.3 million. The land, which will be held in an easement by the Preservation Trust of Vermont, can be used for agricultural purposes. Bruhn said the group may install a public walking path on the land, and maybe a commemorative plaque or stone to celebrate the conservation effort.